Last week, a group of New York street artists took over an abandoned East Village building set for demolition and transformed the crumbling walls into a four-story art gallery. The exhibition, called Surplus Candy, was a semi-secret pop-up art event held for one night only, before the building is torn down to make room for luxury condos. Organized by artist Hanksy, the vast canvas invited artists such as Gilf!, Cern, Elle and Icy and Sot to create site-specific pieces, giving the historic structure one last time to shine before its modern counterpart takes over the lot. Dozens of local street artists were invited to stake their own claims over pieces of the former apartment building over six days. With a message of disdain for increasing rent prices in Manhattan (and New York as a whole), many of the stencils, paintings and sculptures expressed the anxiety an artist faces living in present-day New York. Brooklyn artist Gilf transformed a kitchen into an aggressive installation by smashing glass, plates and appliances as a symbol of the shattered dreams of families who are priced out of their homes and forced to move. Another kitchen evokes the East Village of the 1980s, with colorful graffiti covering the cupboards, windows and refrigerator from floor to ceiling. The guests that were able to figure out the secret address were welcomed by a patterned staircase which lead upstairs in the abandoned apartment building. 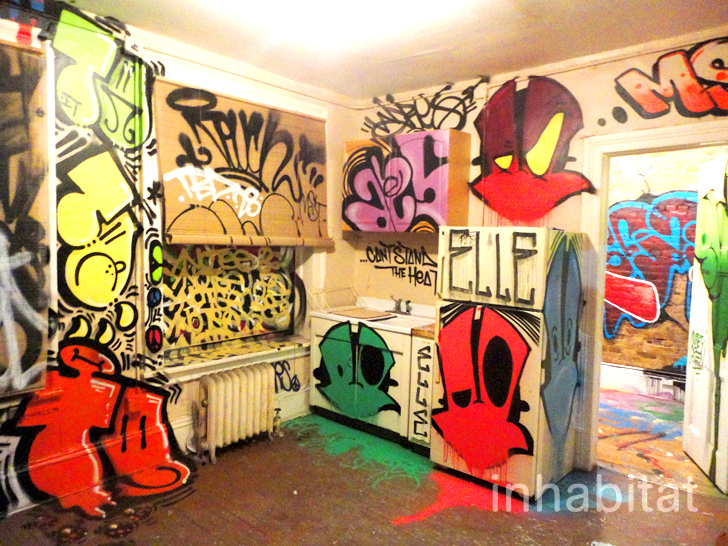 Each of the former apartment doors were open, with each room, closet, bathroom, and kitchen used as not only a gallery, but also a canvas. The building is slated for demolition soon, and the show was open for just two hours on one night. Soon all that remains of the exhibition and the building will be photographs. Check out more incredible images on our Flickr stream! Is this apartment building available for renting? Dozens of local street artists were invited to stake claim over a corner of one of the former apartments over six days. With a message of the disdain with increasing rent prices in Manhattan (and New York as a whole), many of the stencils, paintings and sculptures expressed the anxiety an artist faces living in New York in 2014. Another kitchen evokes the East Village of the 1980s, with colorful graffiti covering the cupboards, windows and refrigerator from floor to ceiling. Brooklyn artist Gilf transformed a kitchen into an aggressive installation by smashing glass, plates and appliances as a symbol of the smashed dreams of families who are priced out of their homes and forced to move. The guests that were able to figure out the secret address were welcomed by a sprawling staircase painted in patterns that lead upstairs with a rickety banister in the abandoned apartment building. Each of the former apartment doors were open, with each room, closet, bathroom, and kitchen used a not only an exhibition gallery, but a canvas- and explore at their own risk of course. The building is slated for demolition soon, and the show was open for just two hours on one night. All that remains of the exhibition- and the building- are the photographs that give the last hurrah to a bygone era of affordable Manhattan housing.